When it comes to planning your dream wedding, it’s understandable that couples will want to pull out all the stops to ensure that it’s a magical day neither themselves of their guests are likely to forget. But with the average UK wedding costing £32,273 in 2018 according to a wedding survey run by Hitched, many couples and family members looking to contribute can face an uphill struggle in financing the big day without having sufficient savings put aside. While many begin to save for a wedding early on, additional unexpected circumstances may result in some soon to be newlyweds needing to borrow some money. One viable option could be to take out a low-interest personal loan for the wedding. However, this decision isn’t one that should be made quickly. So to help you work out if it’s an effective and feasible option for you and your partner, our guide will run through the ins and outs of wedding financing to help you decide if getting a wedding loan is the right course of action to fund the day of your dreams. Despite being referred to as ‘wedding loans’ or sometimes ‘marriage loans’, taking out a loan for your wedding isn’t actually a financial product in itself. They are, in fact, a personal loan you take out to help you fund a wedding – be it your own wedding or that of your child’s. A wedding loan is typically an unsecured personal loan, meaning that the borrowed sum isn’t tied to any of your personal assets such as your home or car. As such, the lender has no means of repossession if you can’t meet your monthly repayments. The total amount is typically borrowed from a bank, credit union, private business or lender. 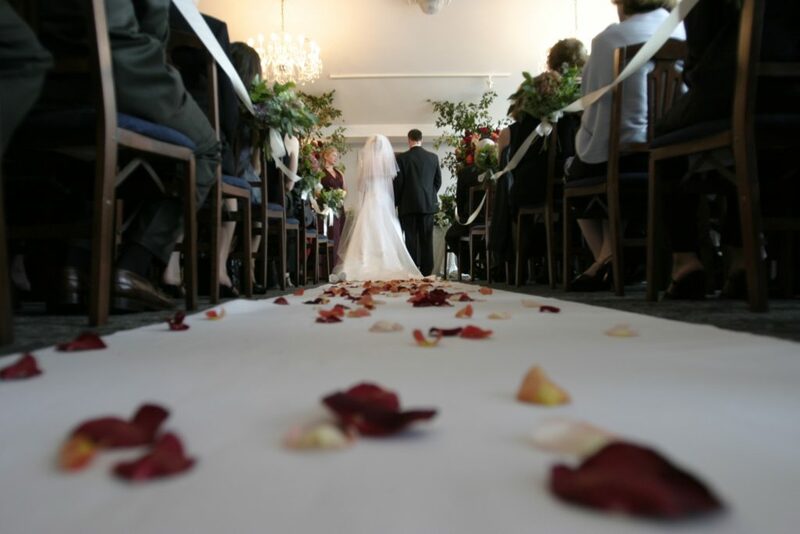 A wedding loan can be used for a variety of purposes to cover the respective costs tied to your special day, such as; the all-important wedding dress and bridesmaids dresses, the church or registry office fee, venue hire, transport and accommodation for both guests and the wedding party, flowers, entertainment and even the honeymoon. Example – Daniel and Jessica are looking to fund their special day and need some additional financial assistance to hire the ceremony and reception venue of their dreams. With a good credit history behind her, Jessica applies for an unsecured, personal wedding loan and is offered £7,500 over a 5 year period at a fixed annual percentage rate (APR) of 3.9% and an annual interest rate of 3.9%. In turn, this means that Jessica can expect to pay 60 monthly repayments (for the 60 months or 5 years she’s chosen to pay across) of £137.56 a month. As a result, once the 5 year period is over, Jessica will have paid back a total of £8,253.50, which is £753.60 in interest charges. Typically offering the opportunity to borrow between £7,500 – £15,000, personal wedding loans with low-interest rates and varied repayment periods (ranging from 1 to 5 years) are undoubtedly an effective, affordable and convenient way to increase your wedding fund. However, before you embark on applying for wedding loans online or through a bank, it’s important to weigh up the pros and cons of falling into debt – and the financial and emotional burdens that come with it. In an ideal world, your big day would be paid for with savings specifically put aside for this purpose, but this isn’t always feasible and may not even cover all the expenses involved – this is where getting a loan for a wedding can offer an attractive solution to bridging the gap. If you’re considering taking out a personal loan for a wedding, they do come with some advantages, as these kinds of personal finance loans tend to boast low-interest rates – making the monthly installments more manageable in the long term. Furthermore, the interest rates and monthly repayments are fixed for the entire term of the loan, which makes it easier for borrowers to budget their repayments. With the ability to choose your own repayment term, you’re able to spread the cost of borrowing over a shorter or longer period to suit your personal circumstances. This affords you the option to either reduce the amount of interest you pay on the loan overall by opting for a shorter term – although the monthly installments will, of course, be higher. Alternatively, you can reduce the monthly payments by spreading the cost over a longer period, which will mean you pay more interest over the lending period (and a greater amount overall), but monthly payments will be lower. With some personal loans for weddings, lenders also offer a repayment holiday clause at the start of the lending term – typically around 2-3 months – whereby you can temporarily pause repayment. After the expense of a wedding, this can help to alleviate the financial pressure and ensure you can enjoy the first few months without the worry of having to pay the money back straight away. As with any personal loan, taking out finance for a wedding is not a decision that should be entered into lightly. Before you commit to this option, it’s imperative to fully assess your current financial situation and feel confident that you will be able to afford the repayments for the full term. It’s also important to bear in mind that any missed payments will affect your credit rating, which could make taking out future loans difficult. With regards to credit ratings, this is one of the key considerations lenders take into account, along with your current financial circumstances, to decide how much you can borrow and the interest rate they will charge you as a result. This means that the best wedding loans with low-interest rates will be awarded to borrowers with good credit rating and a healthy financial portfolio. Those with low credit scores or black marks on their record will be offered higher interest rates or possibly declined personal finance entirely. When considering your options, it always pays to run a credit check first to ensure you have a full understanding of your credit rating and history – especially given that any personal loan applications or rejected applications will show up on your record. Importantly, applying for a number of loans within a short period of time will be clearly visible on your credit record, which lenders look at as part of their decision-making process when determining whether or not to approve an application. For this reason, it’s highly recommended to exercise caution when deciding whether or not to apply for this or any other kind of loan – as a succession of rejected applications paints a picture of a high-risk applicant in the eyes of lenders. Another thing worth considering before even beginning your search for a personal wedding loan is whether you can really afford it. While at the time of taking out the loan it may seem like an affordable and reasonable option that has the potential to help you in the short-term, it’s long-term effects may put you in a worse position later down the line. It’s important to shop around for alternative financing options before you commit to taking out a personal loan to fund your wedding. With many credit card providers offering 0% interest credit cards, you could use credit as a short-term, interest-free loan to fund your dream wedding. However, these types of interest rates are rarely permanent, so be sure to check out all the necessary information that could save you from racking up any unplanned fees. Alternatively, you could also consider the benefits of asking your current bank for an overdraft or even think about peer-to-peer lending as a viable financing option. Peer-to-peer loans allow you to borrow money directly from another person, which effectively cuts out the considered ‘middleman’. Those borrowers with sound credit scores are often highly desirable to lenders and are more likely to be offered competitive interest rates. If you’ve exhausted all other avenues for wedding financing and are still in the mindset that taking out a personal loan for your wedding is the best financial option for you, make sure you get the best deal possible by exploring all potential options. It’s important to do thorough research into current loans available on the market and also create a strict wedding budget to ensure the amount you borrow will be sufficient to cover your costs. We would also recommend seeking financial advice before committing to any loan agreement to allow you to make a fully-informed decision. It goes without saying that having your finances in order and achieving a good credit score will go a long way towards securing you the best possible deal, but even borrowers with bad credit scores can still be eligible for wedding financing. As a poor credit holder, however, you’ll need to be prepared to pay higher interest rates and face tighter restrictions due to being deemed a higher risk to lenders. While wedding loans can be a viable and attractive solution for many couples and parents looking for additional capital to plan the perfect day, the truth is that it may not be the most appropriate solution for everyone. If you’d like to learn more, head to our blog, where you’ll find the latest industry updates, as well as various insights on wedding loans, home improvement loans, holiday loans and more. Don’t forget, if you’re struggling with getting your finances in order, remember that help is always at hand. To find out more, check out the Citizens Advice website here, or call the free national debt helpline on 0808 808 4000 for more information.